That’s it, it’s official: President Trump has taken office. I, too, was hoping for an alien abduction, but we were not so lucky. 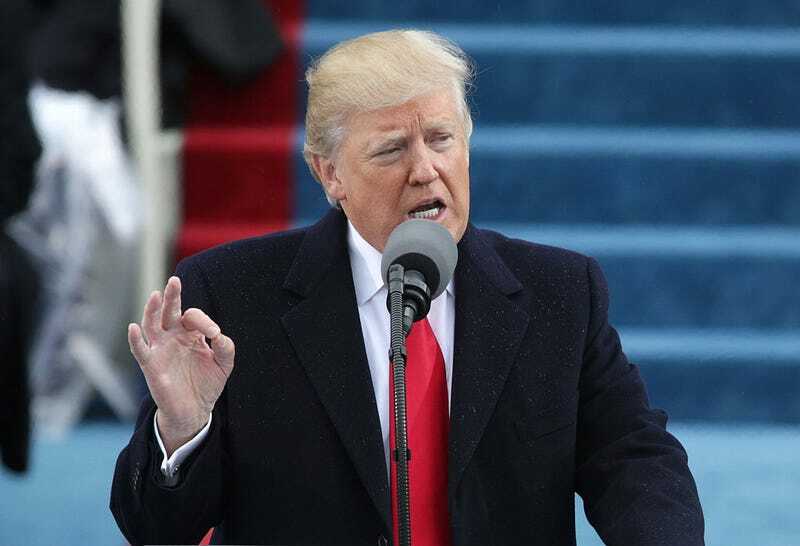 With his hand on a Bible, Donald J. Trump took the formal oath to “preserve, protect and defend the Constitution of the United States” as the nation’s 45th president. Hundreds—hell, maybe even thousands—lined up along the National Mall under a gray sky to witness the annihilation of the American conscience Trump taking office. Dignitaries including 2016 Democratic presidential nominee Hillary Clinton and her husband former President Bill Clinton, former President Barack Obama and Michelle Obama, and former President George W. Bush and Laura Bush were also on hand. In a speech flush with potshots, Trump spoke about how his presidency will be different from those before him. “We, the citizens of America, are now joined in a great national effort,” Trump said after taking office. “We are transferring power from Washington, D.C., and giving it back to you, the people,” according to NPR. Trump also took swings at the education system, which he noted was “flush with cash” but has failed its students; and cited factories that have been left to rust as jobs were sent overseas. And he continued the mythology that inner cities are these murky places strife with violence, despite “reports from the FBI and criminologists that the U.S. crime rate remains near historic lows,” NPR notes. “This American carnage stops right here and stops right now,” Trump said, to cheers from the crowd. Shortly after leaving the stage, Trump took to Twitter, because of course he did, to send out his first tweets as President Trump. To Americans: You will never be ignored again. Your voice, your hopes and your dreams will define our American destiny. Your courage and goodness and love will forever guide us along the way. Together we will make America strong again. We will make America wealthy again. We will make America proud again. We will make America safe again - and yes, together, WE WILL MAKE AMERICA GREAT AGAIN!